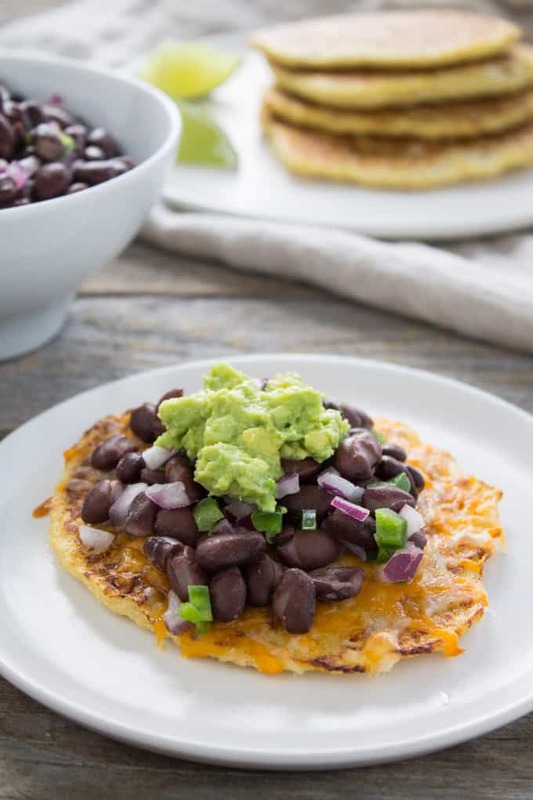 Gluten-free and delicious, black bean and jalapeno cauliflower tostadas are a healthier version of your favorite Mexican fast-food dish. Cauliflower is having a serious moment right now. So serious that this week when planning out recipes to test, I realized that not one, not two, but THREE of my recipes all called for cauliflower. And that would be all well and good if I was the only one capitalizing on the cauliflower crazies. But low and behold, every single grocery store in Boston is out of cauliflower. It was driving me bonkers earlier this week because I had no clue what was going on with this vegetable. Come to find out the cauliflower growers are having issues with their harvest and so they jacked up their prices. And all the grocery stores were like yeahhhhhh no, we’re not paying that. And now here I am cauliflower-less and exhausted from taking the grand grocery store driving tour of Boston. At least I managed to get enough for this recipe today though. Worth it for the cauliflower tostadas. This month’s Recipe Redux theme is celebrating 54 months of Recipe Redux! It’s hard to believe that I’ve been reduxing recipes for over four years now. Cheers to Regan, Deanna and Serena, three RDs who I adore and admire, for kicking this thing off 54 months ago. It’s been a fun ride to watch it (and me) grow and evolve over the last 54 months. To celebrate 54 months, we were asked to grab our nearest cookbook and redux the recipe from page 54 or 154. I grabbed my cookbook Food: Vegetarian Home Cooking by Mary McCartney, which is an older cookbook of mine and I couldn’t tell you where I found it. But I do remember buying it because of the simplicity of the recipes and at the time I was looking for easy, veg-friendly recipes. 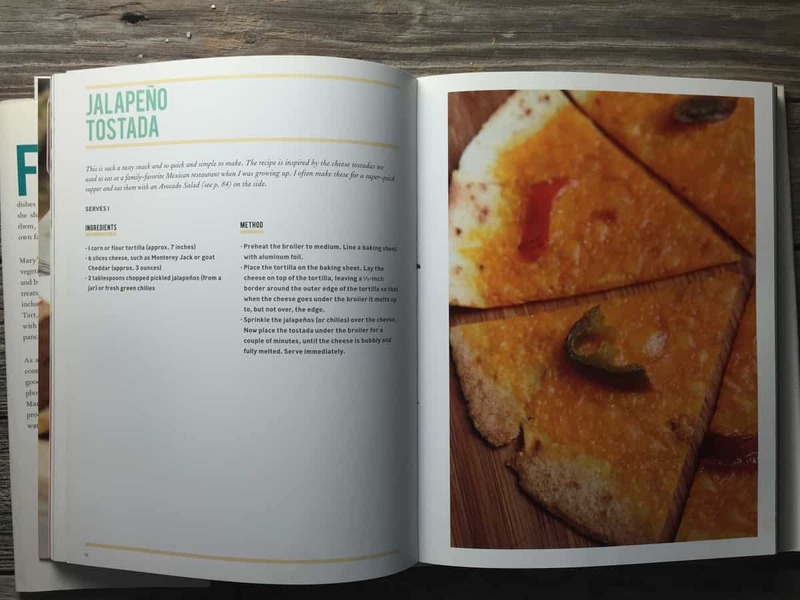 So on page 54 of Vegetarian Home Cooking, we have a jalapeno tostada with a flour tortilla, cheese, pickled jalapenos, and…oh wait that’s it. So I thought we could up our tostada game by making cauliflower tostadas with a black bean and jalapeno salsa. Cauliflower tostadas (aka tortillas but I just made them smaller) are much easier to make than I thought they would be. And let’s be clear, I didn’t invent these things. They’ve been floating around the blogosphere for a little while. But I think they’re genius. 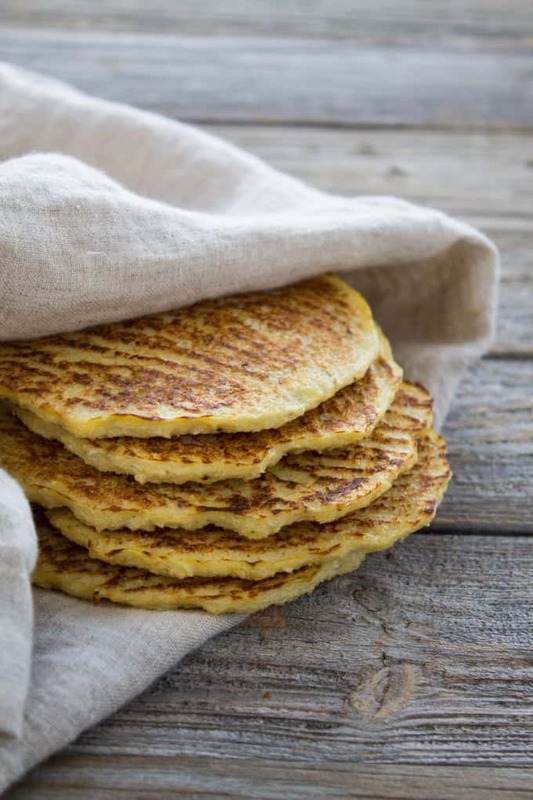 Not only because they’re a great gluten-free alternative to flour tortillas but they’re a way to pack in more veggies! These tostadas are totally filling and delicious – I love the spicy Sriracha contrasted with the cool, creamy guacamole. Taco Bell, watch out. Your tostada days be numbered. Cauliflower is where it’s at. Preheat oven to 375 degrees F. Line baking sheet with parchment paper. In a food processor, pulse cauliflower to couscous-sized granules. Some florets may not break down. Pull these out and set aside. Transfer cauliflower “couscous” to a microwave-safe bowl and reprocess the larger cauliflower pieces. Microwave cauliflower for two minutes, stir and microwave for another two minutes. Transfer cauliflower to a cheesecloth (or dish towel) and squeeze to drain out any excess liquid. Place the cauliflower back in the bowl and add two eggs, salt and pepper. Mix together until mixture is wet. Transfer 1/4 cup mixture to baking sheet and smooth into a round circle. Repeat 7-8 times (you will need two baking sheets). Bake for 10 minutes. Flip tortillas over and bake for another 6 minutes, or until golden brown. 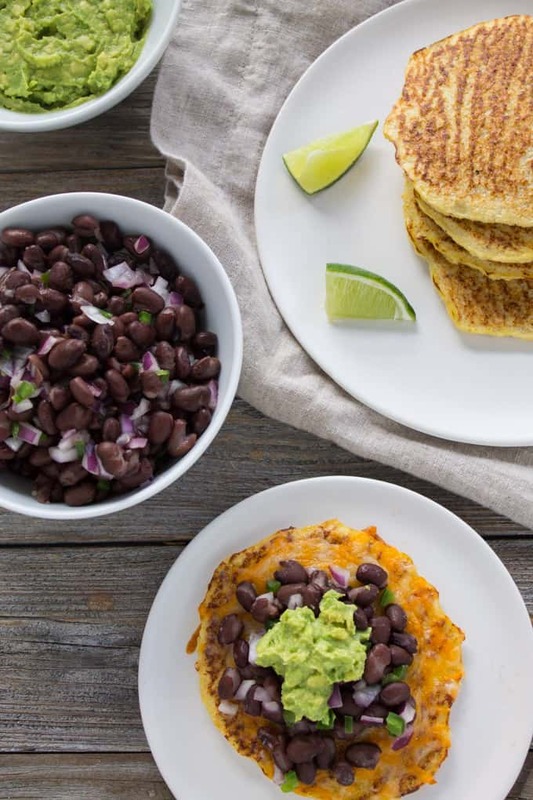 In a cast iron pan (or skillet) over medium heat, press tortillas down into the pan using a spatula, about 30-60 seconds on each side, until browned and crispy. Sprinkle cheese over each tortilla and place underneath the broiler for about 5 minutes, or until cheese is melted and bubbling. Meanwhile, in a medium-sized bowl, combine black beans, red onion, jalapeno, lime juice, salt, and Sriracha* to taste, and toss to coat. 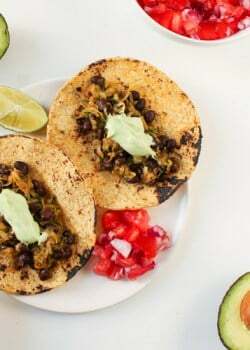 Spoon black bean mixture over top of tortillas. 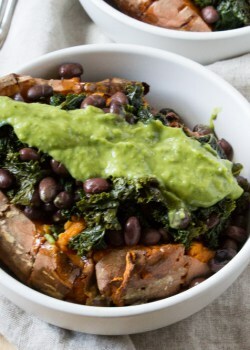 *You can either add 1 tablespoon Sriracha to black bean mixture or you can drizzle some over top at the end. 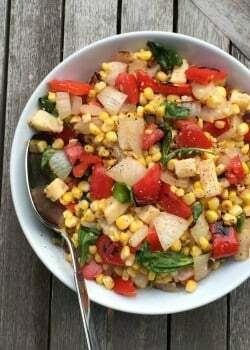 Such a unique and amazing recipe! Great!! Ditto to what MArissa said! It was $4.99 at my store and I said no thanks too. But maybe it’ll come down soon! In the meantime, I want to try these with Frozen cauliflower. I sure hope so! Frozen is a great idea. Awesome idea Kara! Cauliflower is so versatile, I have a recipe for chocolate cauliflower crust for dessert pizza and I even amazed myself that it actually worked! Love the creativity! Thanks, Abbey! Wow that cauliflower dessert pizza crust sounds amazeballs. Must try! I didn’t know there was a cauliflower crisis! That’s too bad because I want to make these stat! I will say cauliflower is a bit of my arch nemesis though, I mean it’s so mess y but so good! 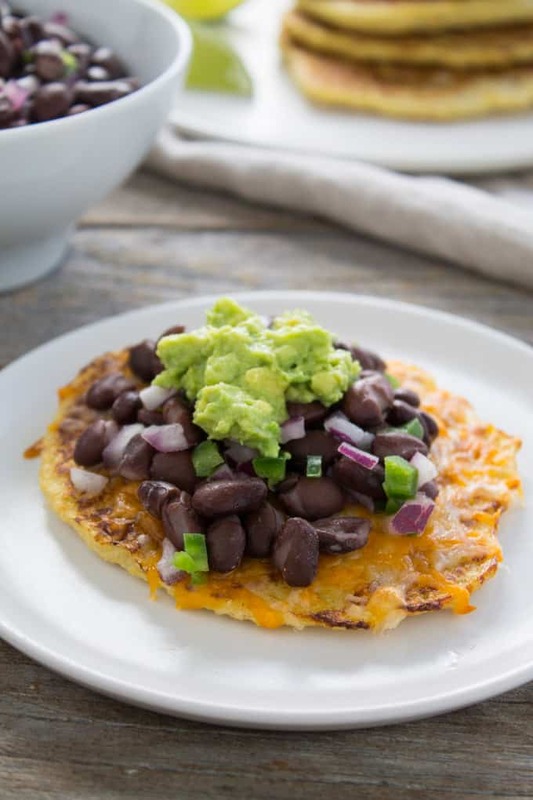 I have been so bummed by the cauliflower shortage, but I may just have to splurge so I can try out these cauli tostadas! They look amazing! 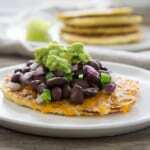 And of course you can’t go wrong with black beans and jalapeno! Thanks, Jessica! I’m hoping this shortage doesn’t last much longer! Yum, looks delicious! 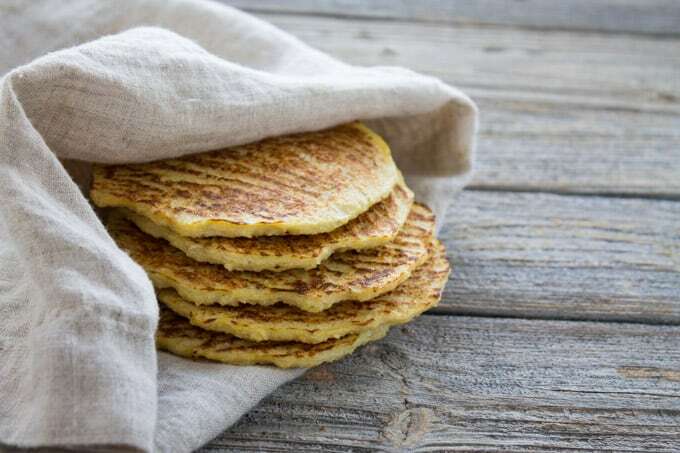 Do you think these can be made vegan using flax eggs? Thanks, Samantha! I think it’s definitely worth a shot! Let me know how they turn out if you try them! Thanks, Allie! Let me know how they turn out if you try them. What!? You have just changed my world Kara! I totally love this idea!!!! woa, I can’t believe those tostadas are made from cauliflower! They look so good! I have seen cauli rice and potatoes before but never tortillas! Bummer about the expensive cauliflower, it must be an East coast thing because our stores still have plenty of cauliflower. I want this for lunch and now you have me worried that I won’t be able to find cauliflower in Boston. NOOOOOO! Haha hopefully you’ll have better luck than I did! Thanks for shedding light on the cauliflower crisis. Last week, I passed on the $5.99 head of cauliflower at my supermarket. I wondered what was going on. 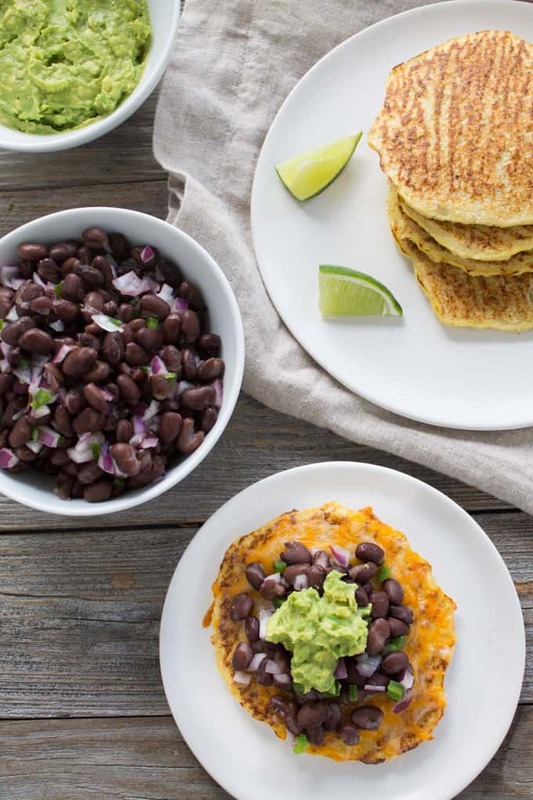 I decided to do tostadas for this redux too but none like this – these cauliflower tortillas look and sound amazing! Can’t wait to try it!